One particularly fascinating part of the preserved record of the dinosaurs is the extensive track ways and “nesting sites” with fossilized eggs. 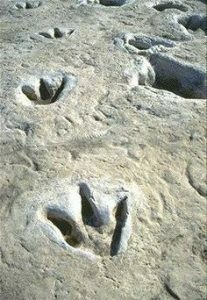 These remains have been a challenge to creationists and evolutionists alike. For creationists, the question has been how can there be activity on top of layers of strata supposedly laid down by the flood? 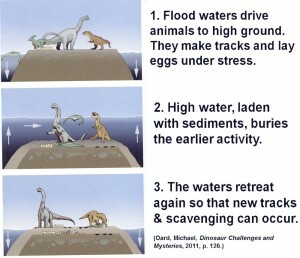 Were dinosaurs walking around and laying eggs in the middle of the Noachian catastrophe? For evolutionists, there are multiple difficult issues to explain. 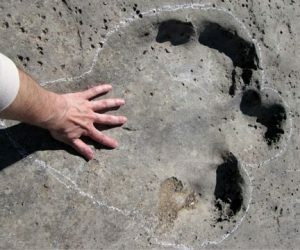 During the past 20 years, dinosaur track ways have been discovered at over 1,500 locations from around the world, with the total number of tracks in the billions. But how were all these tracks preserved? Today’s animal tracks in mud are not fossilized. Instead, erosive processes rapidly erase them. In addition, the tracks are not meandering as usually would be expected. They are typically all moving in a straight line like a highway. And there are almost no juvenile tracks (as if only the mature healthy animals were still surviving and able to flee ahead of the catastrophe that fossilized the tracks). There is a puzzling absence of tracks from stegosaurs, ankylosaurs and ceratopsians. These heavy, armored reptiles would be poor swimmers and slow to flee. Hence, it would not be expected that they would have survived the initial waves that laid down those sedimentary layers that recorded these footprint trace fossils. 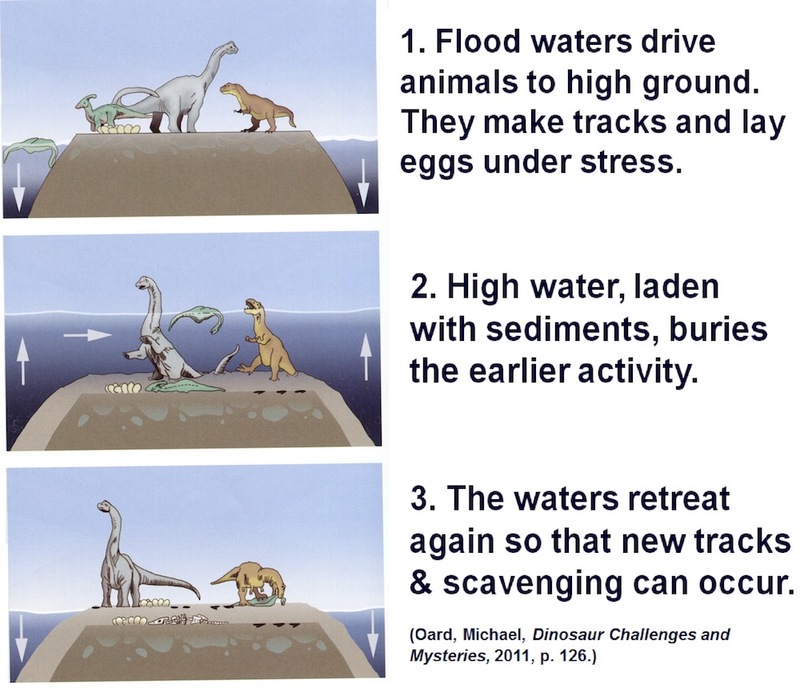 In his 2011 book Dinosaur Challenges and Mysteries Michael Oard puts forward a model of Briefly Exposed Diluvial Sediments (BEDS) to explain the data. His hypothesis postulates that alternatively rising and lowering flood waters, coupled with rapid sedimentation during the Genesis Flood best explains the features. It is quite reasonable that tectonic activity, meteorite impacts, and tidal forces would create oscillating water levels. Dinosaur eggs, nests, embryos, and occasionally hatchlings, are now recognized from about 200 locations around the world. But there is typically no vegetation preserved around the egg clutches. Eggs appear to be laid directly on flat bedding planes (like a beach or mud flat or other soft sediment layer). 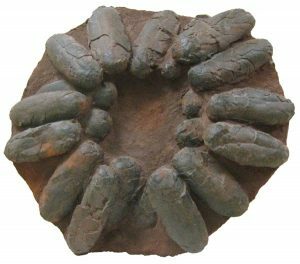 “Despite the relative abundance of dinosaur eggs in the fossil record, trace-fossil evidence of dinosaur nest construction is extremely rare. The existence of nests is typically inferred by the presence of an egg clutch and usually it is not accompanied by physical evidence of nest architecture” (Chiappe, L.M., et al., “Nest Structures for Sauropods: Sedimentary Criteria for Recognition of Dinosaur Nesting Traces,” Palaios 19, 2004, p. 89.). This is uncommon behavior for reptiles, who typically bury their porous eggs in the ground or under vegetation to maintain humidity and hide them. Some of the dinosaur egg shells are also multi-layered, giving evidence of being laid under stressful conditions. 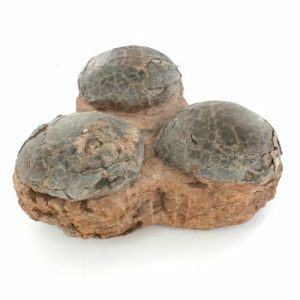 These fossilized dinosaur eggs are further evidence of catastrophic global conditions and support the BEDS model and the Genesis Flood.